In a primary school gym, some kids are being taught about safety on the streets. And they’re learning a bit about self-defence as well. Kenpo is a relatively modern martial art that first travelled to Hawaii from China, and from there to the US. The American grand master is responsible for instructing police officers and FBI agents in techniques for ending dangerous conflict, quickly and decisively. Hopefully, the kids today will never find themselves in those sorts of situations. The kenpo they are learning here has been simplified for their understanding and enjoyment but still focuses on the main principles of the martial art – hand speed and power. The children are taught to hit hard first and then run away. Hand speed comes later. The children progress through a series of stages in their training. These are marked by the same colour belts as are worn by adult kenpo practitioners. The simplified gradings give the kids a sense of achievement and they can then take the kicks and punches and arm-locks they have learned with them as the basis of their training when they begin adult kenpo. Above all, however, the kids are learning a very specific message about safety on the streets. 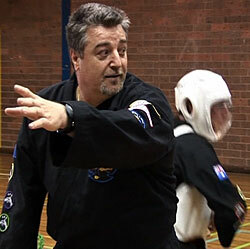 “When do we use our self-defence?” asks Nolly, the instructor. “In danger,” reply the children. They acknowledge that it is unlikely that a small child could overpower a full-grown man, so the focus is on one or two quick movements that will enable the child to break the attacker’s grip, and perhaps momentarily incapacitate them, so the child can run away. Nolly moves quickly between the exercises so the kids don’t get bored. He also makes the lessons specific to the schoolyard. Kenpo doesn’t just defend against grown-ups but bigger kids as well. At certain stages during the evening, children of different ages work together. This makes the smaller ones confident in the presence of larger kids and it teaches the bigger kids patience. All of this happens under the watchful eye of proud mums and dads. They can all attest to the increase in the children’s confidence through Kenpo 4 Kids. Because the kids have been extra good tonight, they are rewarded with a very special visitor. Kenny Kenpo is the tiger mascot of Kenpo 4 Kids. The kids are all eager to show Kenny what they’ve learned. As the excitement levels climb through the roof, the parents also get in on the act. It seems like chaos but it’s all part of the fun. Finally, Nolly calms things down with one last drill. At the farewell, the kids repeat their motto of respect for their parents, their teacher and each other. The kids leave focused and happy, and the parents are happy too. Visit Kenny Kenpo at the Kenpo 4 Kids website.